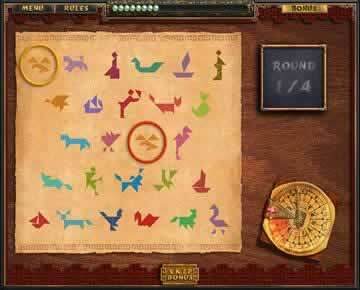 Liong: The Lost Amulets Game Review - Download and Play Free Version! Both traditional and adventure modes. Adventure game has other mini 'eye spy-like' games interspersed. The shiny jade pearls you find can be exchanged for hints. Choose between 6 sets of tiles to play with. You cannot build your own layout. Even in the traditional mode you have to follow the set layout. Mahjong in adventure mode lacks difficulty. Use Your Skills to Restore Harmony to Nature! Five beautiful amulets keep the elements in balance. It's up to you to put your puzzle-solving skills to the test to find them and restore harmony to nature! Solve a variety of fun puzzles and complete more than 100 levels in this fascinating stand alone sequel to Liong: The Dragon Dance. To find each amulet you must locate a series of hidden objects in beautifully-illustrated Chinese-themed scenes. You will be asked to find many different objects or a series of the same objects, such as a certain number of yin-yang pendants. Then restore each amulet by solving puzzles including varying versions of mah jong tile matching, matching pairs of concealed tiles, bingo and more using your choice of beautifully-designed tiles. The gorgeous graphics and exotic music paired with fun mini games makes this game the full package. The variety of mini games will keep you on your toes and you won't get bored. You'll have the chance to use and improve on all types of skills ranging from making strategic decisions to finding carefully-hidden objects to thinking quickly and more. For a fun-filled bundle of beautiful, entertaining games start playing Liong: The Lost Amulets and find the five amulets! Liong: The Lost Amulets is an adventure based mahjong game that has you on a quest to find the lost amulets and restore harmony to nature. The game offers two modes and has mini-games laced throughout the adventure mode that can break the monotony of simply playing mahjong. 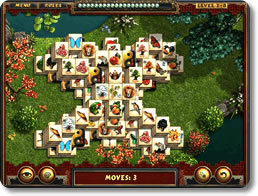 As far as mahjong titles are concerned Liong: The Lost Amulets branches away from what is typically seen in this unique, adventure-packed tile pairing game. Mahjong, for those of you unfamiliar with the game, is a Chinese tile matching game. Each level presents a new layout in the game, and it is your goal to match all the tiles, leaving nothing unpaired. Mahjong combines acute calculation, skill, and strategy, as well as a great deal of luck. Often times skill can be the dominating factor in the game. Liong: The Lost Amulets incorporates traditional gameplay of mahjong, while also providing an adventuresome twist. In the traditional game you have to match like tiles in order for them to disappear. There is a time limit in which you have to complete the task. If luck and or skill is not on your side and you do not complete the puzzle you can restart the puzzle until you successfully complete it. If you need help hints are available at the cost of one jade balls. These balls are hidden throughout the game board and can be collected at anytime. The second mode of play is an adventure mode that has you on a quest to bring harmony back to nature. To do so you must find the five missing Amulets by completing different mahjong puzzles and mini-games which are dispersed throughout play. These mini-games differ in objectives but all have a mahjong and matching element. 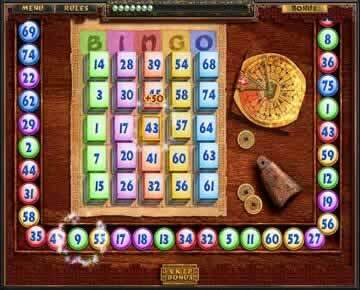 “Bingo” for example is a bingo card that has tiles stacked in each of the columns. Tiles pass through on a conveyor which you must use to clear the bingo board. If you are successful you earn bonus points and get a step closer to restoring order. The mahjong within the adventure mode is also a little different than typical mahjong, making it easier. Rather than have to find matches from all the tiles on the board, you are given six tiles in a tool bar that you can use to find matches. Bonus points are awarded for consecutive tiles of the same pattern. The adventure mode also provides you with the luxury of finding jade pearls and exchanging them for rewards. You can exchange for hints, new tiles, and even to have 10 to 25 tiles eliminated. The rewards are very helpful, and like in the traditional mode, the jade pearls are hidden throughout the game. Though the mini-games offer a unique element to the game, they can often be monotonous and frustrating. Having to find objects in an I Spy game or having identify 15 differences between two pictures can be more of a drag than a challenge. Yes, the games can be fun and are a nice change up to constantly playing mahjong, however, some of them can be extremely boring and slightly painful. Several other features missing in this game are a multiplayer mode, online play, design your own layouts, and downloadable layouts. Not having the ability to play online or download new layouts via the internet limits this game. One of the main elements of the traditional tile game is setting up your own pieces, so not being able to in this game is limiting. More layouts would be an easy addition to the game, making the game much better. On the whole Liong: The Lost Amulet is a fun adventure based mahjong game. The quest elements as well as some of the mini-games are surprisingly entertaining. Though some of the games can get old quickly, they typically do not last long, making them bearable. This game would be great for anyone just getting into mahjong, or for a seasoned player looking for a change up. Liong: The Lost Amulet is worth the time it takes to download so go ahead and give it a try. See the combinations of hidden object games, tile-matching puzzles, and various other mini-games which can be found in Liong: The Lost Amulets.